[joe] and [ryan] built Thumper for their high school FIRST robotics team. The cannon itself is a solenoid-fired compressed air launcher that gets its juice from three large PVC tanks stored in the box below the turret, and the cannon is able to be fired nine times between visits to the air compressor. It was intentionally designed to resemble an M2 Browning 50 Caliber heavy machine gun, with the two vertical handles and boxy body. They finished construction in about a week with a budget of only $300. When they saw that a lot of their friends had also built cannons, they scrounged for parts from their garages to re-use to build the mobile platform simply for one-upmanship sake. The motor and drive-train propelling this behemoth came out of a 1980s-era mobile X-Ray machine that had been discarded by a local hospital. The rear wheels were specially modified to fit the drivetrain, and the front end is a chopped, hacked, and welded axle and steering mechanism from an old lawn tractor. Sections of unistrut form the rest of the frame. [joe] and [ryan] were even asked to bring Thumper to their high school prom as a unique way to hand out T-Shirts for the evening. Unfortunately, there’s no website for this build. See video of Thumper in action with a Nerf Football after the break. 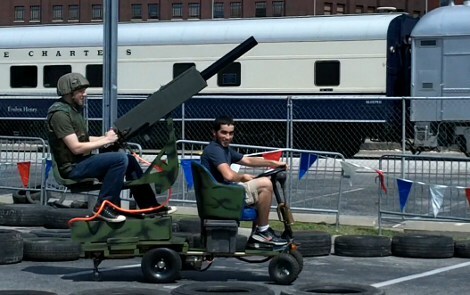 Hack A Day even got to take it for a spin around the Power Wheels Racing Series track at Maker Faire KC! [Arao] wanted to measure the RPM of a spinning wheel using parts that he could scavenge from his junk box. A bit of thought led him to build a reflective sensor which can measure the spinning of a wheel (translated). He got his hands on an infrared phototransistor which had been used as part of the remote control for some consumer electronics. Snooping around with his multimeter helped him establish the pin out of the device. By positioning an IR LED inside of a shroud, yet adjacent to the phototransistor, he can measure the intensity of the LED’s light as it is reflected off of nearby surfaces. 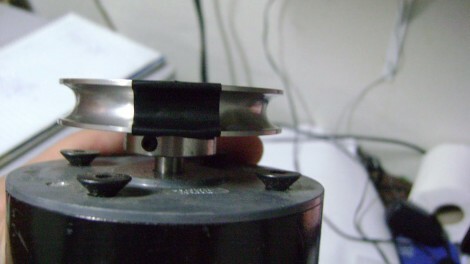 The pulley seen above has a piece of electrical tape on it. When this passes by the LED, less of the infrared light is reflected and the drop in intensity is picked up by the phototransistor. [Arao] made the system rock-solid by rolling an LM358 op-amp into the circuit. He’s posted the schematic as well as some screen shots from an oscilloscope during testing. Kiss the days of breaking bits while drilling through-hole PCBs goodbye thanks to this semi-automatic drill press (translated). Now it’s not going to line up the bit with the exact location of the hole (that would make it a fully automatic drill press). This works by lining up the board manually, then stepping on a pedal to activate the plunging motion of the drill. 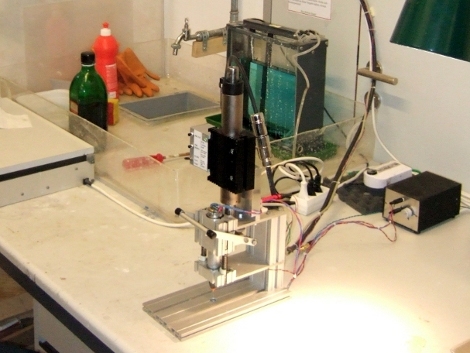 A linear motor is responsible for the smooth, accurate motion along the Z-axis. Many hobby setups use a Dremel drill press, or even rely on prayer-based systems such as doing it free-hand with a rotary tool or by using a piece of acrylic as a guide hole. The hobby drill press tends to have some play in it and free-handing with tiny bits that are as fragile as glass both result in far too many broken drill bits. In the video after the break you can see that the linear motion is perfectly plumb with the table of the device, preventing the movements that cause breakage. The addition of the pedal makes it easy to position the boards because you can use both hands. Having a tool like this takes all of the frustration out of using through-hole parts. Ring ring ring ring ring ring ring Emotiphone! 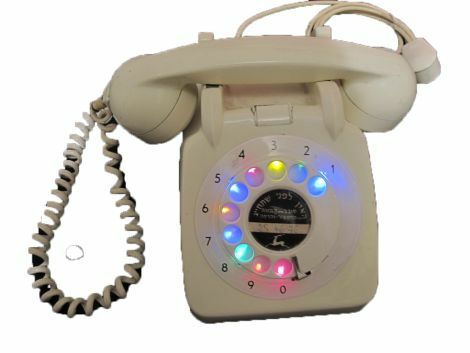 Instructables user [zvizvi] was working on putting together a portfolio for his application into Industrial Design school, and thought it would be neat to repurpose an old rotary phone that used to belong to his grandmother. He originally had pretty lofty goals for the phone, but eventually pared back his vision to include one-way communications to Twitter. After gutting the phone of its unnecessary parts, he got busy installing LEDs behind the dialer’s finger holes. The LEDs were connected to an MCP23017 I/O expander, which takes its direction from an Arduino he crammed into the phone’s shell. When the receiver is lifted from the cradle, the Arduino initiates a connection to the Internet via the WiFly shield he installed. Once he dials a number, the Arduino translates the digit into a predefined emoticon, posting it to his Twitter page. While the emoticons are not quite as descriptive as the messages from the Tweeting Roomba we featured earlier this week, they relay his mood just fine. It’s a fun project, and it happened to get [zvizvi] into the design school he was applying at, so we can’t ask for much more than that. [Markus Kayser] built an amazing solar powered SLS printer, but instead of using lasers and powdered plastics his machine uses the power of the sun to heat sand into complex shapes. [Markus]’ printer uses the same concept as his earlier solar cutter – burning things with a magnifying glass. Interestingly, the printer isn’t controlled with stepper motors and reprap electronics – it’s completely cam driven. The solar panels only power the motor attached to the frame moving on bearings made from skateboard wheels. We’d guess that [Markus] is using a little more than 2 square meters of Fresnel lenses in his project. Since solar irradiance is about 120 W/m² (PDF warning), [Markus] is concentrating a lot of energy onto a point the size of a quarter, which would be necessary to heat up sand to its 1500° C melting point. The resolution isn’t what you could get with a laser, but [Markus] was able to print an amazing bowl along with other complex 3d shapes. Check out [Markus]’ video of the solar sinter printer after the break. There’s also a video of his previous experiment with the solar cutter. 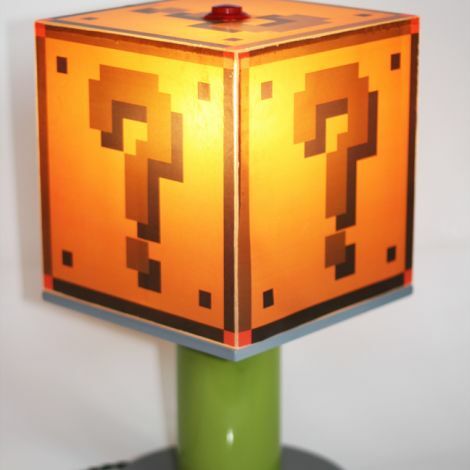 [Laurence] was racking his brain coming up with potential birthday gifts for his friend when the idea of a Super Mario Bros. coin block lamp popped into his head. The block is constructed from drain pipe, a few pieces of plywood, some perspex, and a whole lot of awesome. He wanted the lamp to make sounds when it was turned on and off, so he put together an audio circuit based on [LadyAda’s] WaveShield. His design is similar, though he swapped out the DIP packages for SOIC versions, adding a DAC, Op amp, and an audio buffer to fit his needs. Once he had his electronics in order, he started construction of the lamp, painting the drain pipe green and mounting it under his light’s base. He built a large perspex box to serve as the coin block itself, printing the familiar graphics on tracing paper which he then glued into place. An arcade button adorns the top of the box, making for a very appropriate and fun light switch. Be sure to check out the video below to see the lamp in action. We’re just a bit jealous of [Laurence’s] friend, and we sure wouldn’t mind having one of these in our office to sit alongside this mechanical coin block we featured a while back.